﻿ News&Event：News Release｜Japan Display Inc.
Japan Display Inc. (JDI), a leader in automotive displays and Faurecia, one of the world's leading automotive technology companies today announced a partnership to enhance the digital user experience in vehicles. JDI and Faurecia will cooperate on the development and integration of large displays into automotive interiors. The two companies will leverage their know-how and expertise so that the functionalities and design of large displays will be a key element of cockpit attractiveness. 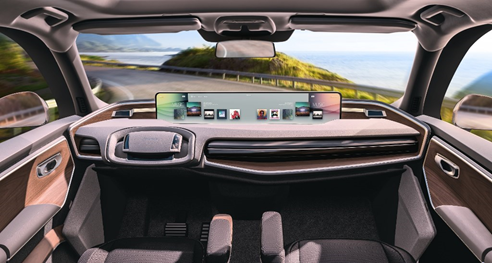 "From the perspective of a display manufacturer we are looking at a very interesting and technology-driven future of the complete automotive market. Therefore the trend towards autonomous driving, and smart surfaces with a new way of living, requires a complete re-thinking of the possibilities and needs of all passengers in the vehicle. Our JDI-team, together with the Faurecia technology experts, has investigated and developed a completely awesome and first-in-class display, which will fit to every kind of new well-being scenarios the passengers will live, feel, see and enjoy in the future vehicles." "Connected vehicles, autonomous driving, ride sharing and electrification are set to radically change the driving experience and as consequence vehicle interiors. Versatility and personalization of displays will be key for facilitating different onboard activities. By combining our expertise, JDI and Faurecia will develop innovative displays adapted to different use cases to enhance the user experience. And Faurecia will leverage its knowhow to ensure safety, high-perceived quality and seamless integration of displays into the cockpit." During CES 2019, Faurecia and JDI revealed a first illustration of their capabilities by showcasing a world premiere 32.1inches 6K display integrated into an instrument panel. Drawing on advanced mechatronics, kinematics, materials and design to offer an optimized user experience, the instrument panel surface smoothly adapts its shape and the display moves according to the driving or autonomous mode. During driving mode, the display can be used as a driving cluster giving information and safety signals as well as offer a central screen for navigation and media. In autonomous mode, the display transforms into a large format entertainment screen. This combined with front seats that can swivel inwards, creates a new shared "onboard cinema" experience to share with all the family. Founded in 1997, Faurecia has grown to become a major player in the global automotive industry. With 290 sites including 30 R&D centers and 109,000 employees in 35 countries, Faurecia is now a global leader in its three areas of business: automotive seating, interior systems and clean mobility. Faurecia has focused its technology strategy on providing solutions for smart life on board and sustainable mobility. In 2017, the Group posted total sales of €17.0 billion. Faurecia is listed on the Euronext Paris stock exchange and is a component of the CAC Next 20 index. Japan Display Inc. (JDI) is the leading global manufacturer of advanced small- and medium-sized LTPS LCD panels. By leveraging its advanced technologies and the world's largest LTPS production capacity, JDI provides high resolution, low power consumption and thin displays for smartphones, tablets, automotive electronics, digital cameras, medical equipment and other electronic devices. JDI, which commenced operations in April 2012, was formed through the consolidation of the display panel businesses of Sony, Hitachi and Toshiba. The company's common stock is traded on the Tokyo Stock Exchange with the securities code number 6740. The information contained in this press release is accurate as of the date of issuance and is subject to change without notice. Information in this press release, other than statements of historical fact, constitutes forward-looking statements, which are based on available information, operating plans and projections about future events and trends. Forward-looking statements inherently involve risks and uncertainties that could cause actual results to differ materially from those predicted in such forward-looking statements. (C) Japan Display Inc. All Rights Reserved.